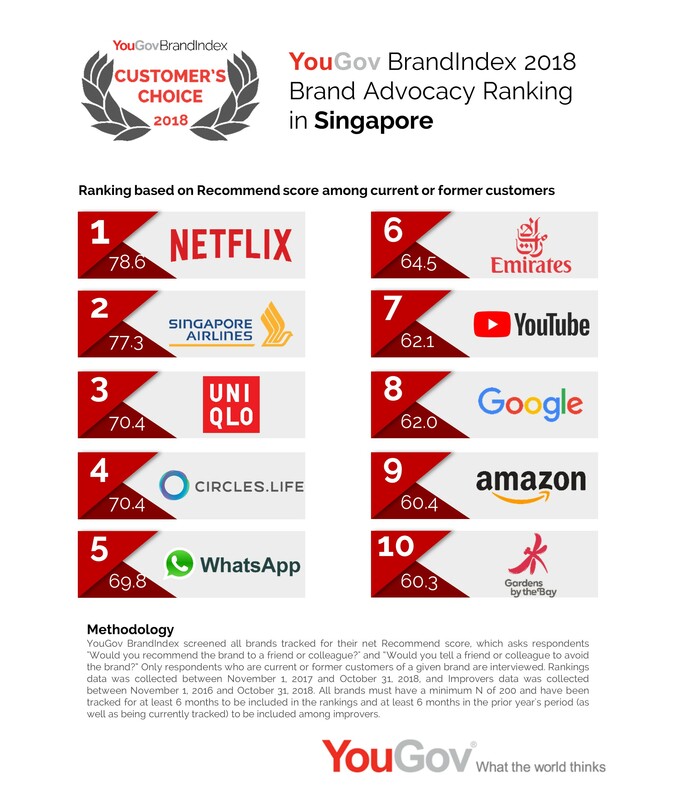 on November 21, 2018, 1:48 p.m.
Netflix has the strongest brand advocates among Singaporean consumers, new analysis from YouGov BrandIndex reveals. The streaming subscription service heads the list with a score of 78.6. The top three is completed by national carrier Singapore Airlines (77.3) and Japanese retailer Uniqlo (70.4). YouGov’s rankings are a form of net promoter score and look at the brands’ current and former customers and analyse which one have the highest proportion of people recommending them to a family member or friend. Digital brands dominate the top ten. Telco company Circles.Life is in fourth place (70.4), followed by instant messaging platform Whatsapp in fifth (69.8), video-streaming platform YouTube in seventh, technology company Google in eighth (62.0), and e-commerce platform Amazon in ninth (60.4). The list is completed by brands from the travel industry, with Emirates airline in sixth (64.5) and popular Singaporean destination Gardens by the Bay in tenth (60.3). YouGov also reveals which brands have the most improved level of customer advocacy. South Korean smartphone manufacturer Samsung comes top, (a rise of +12.5 points), ahead of its competitor Huawei (up +11.8 points), and Malaysia Airlines (which has improved by +10.6 points). The YouGov BrandIndex Brand Advocacy Rankings were calculated by measuring recommend scores among each brand’s customers for the twelve-month period through October 2018. Scores are calculated by subtracting the negative responses from the positive responses. Respondents were drawn from YouGov’s online panels of 6 million consumers across 38 markets. The index looks to give brands a good indication on how well or poorly they have been doing in terms of their customer service, as well as quality of services and products provided.